A relative of mine, Roland Wayne Lam, was in the US Navy 04/06/1938 through 09/29/1945. After his basic training through November 1941 he was on the USS Chaumont (AP-5). Roland was a chief petty officer and worked in the XO's office. He left the ship in Pearl Harbor just before it left for Manila on 29 Nov 1941, and so he was there during the Japanese attack. 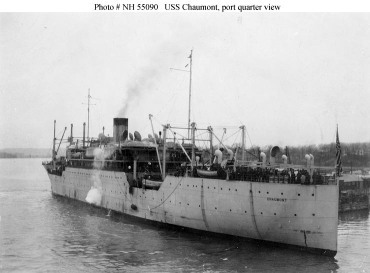 The Chaumont was initially an auxiliary transport commissioned in 1921. She crossed the Pacific continuously until 1941, stopping in San Francisco, San Pedro and San Diego on the US west coast; Pearl Harbor in Hawaii; Manila; and several ports on the Chinese coast. Once a year or so she traversed the Panama Canal to visit the US east coast — Norfolk for maintenance, and sometimes port calls in New York and the Caribbean. I was surprised and pleased to find your transcript of the log of the U.S.S. Chaumont, which gave me the dates when my mother, my younger brother, and I were evacuated from Tsingtao to Yokohama in October 1937. All I remember was that it was in the fall, after I had started school. Thanks for your good work. After the Japanese attack on Pearl Harbor in December 1941, she ran men and supplies from Seattle to the Aleutians. She was decommissioned in August 1943, converted to a hospital ship, and recommissioned as Samaritan (AH-10) in March 1944. She was decommissioned and sold for scrapping in early 1948. Detailed History Ports of Call July 1937 through June 1941 Photos from history.navy.mil Photos from navsource.org Photos from the Panama Canal and Shanghai Photos of envelopes and letters sent from on board, pennants, etc.